You can tell from her staff bag that Kimberley Crooks is from England. 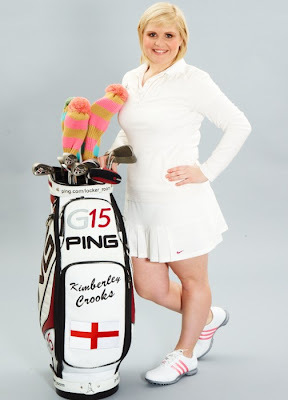 A Yorkshire girl, Kimberley got into golf at age 10 (following her father's and brother's leads) and progressed through the Yorkshire Junior and Yorkshire Ladies teams. Kimberley turned pro early in 2010 and got her feet wet on the Ladies European Tour last year. In 2011, she's playing the LET, LET Access Series and also on the Banesto Tour in Spain. When not golfing, Kimberley keeps busy with badminton, table tennis and pool - but says "my second sport has to be shopping!"